There have been quite a lot of hype going on about the Canon EOS 5D replacement for the past year or so. This fever reached an alarming level in the past few weeks with the approach of photokina. Not wanting to be an echo in the rumor mill I refrained from posting anything concerning the digital camera I’ve been hopping to see. However today there is a teaser on canon website hinting for a new dSLR so this is no rumor! Could it be pointing to the 5D replacement (whatever they will call it) or more like a new 1D body ? I have thrown the picture in Adobe Photoshop and played around with the curves to make the image brighter it looks like it has a built-in grip. 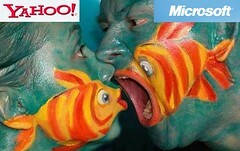 It is all over the web Microsoft offered 44.6 Billions US dollars to buy Yahoo on Friday! 44.6 Billions US dollars and who is concerned the most? Flickr users! Yes, It seems that Flickr fans are not happy at all about the news at all and they gather showing their malcontent and frustration doing what they know how to do best, UPLOADING IMAGES! The just newly created group MICROSOFT: KEEP YOUR EVlL GRUBBY HANDS OFF OF OUR FLICKR already count 951 members 128 photos and 33 posts ! A small notice some pics there are not exactly “work safe” and contains bad language ! The Canon 450D is here, read between the lines !! Although this is fresh news it is already wide spread ! Canon just announced a few hours a go the EOS 400D (or xti) replacement the Canon EOS 450D (or xsi) at a body only price of $800. 12.2MP CMOS DIGIC III sensor: I wonder what a 12.2MP on a APS-C sensor, aren’t we pushing the technology a little to far? SD/SDHC cards storage : What about those who previously invested in CF cards ? So if you are among the people who were craving for in-body stabilization looks like Canon just gave you a clear answer didn’t they ! Less than 12 months after its complete web 2.0 relaunch, SmugMug raises, once again, the bar for the competition by releasing a new set of features.